The backstitch produces a strong, bulky seam that doesn’t have a lot of stretch. Use it whenever you need to join two pieces together with a sturdy seam, like for bags or baskets. You work the backstitch on the wrong side of the project because it’s visible (and not exactly pretty). The key to understanding the backstitch is to think of it as two steps forward and one step back. This is because you bring the needle to the front of your fabric two spaces forward and then push it to the back of the fabric one space back. You can use the backstitch to join pieces along the tops or sides of the parts that need joining. 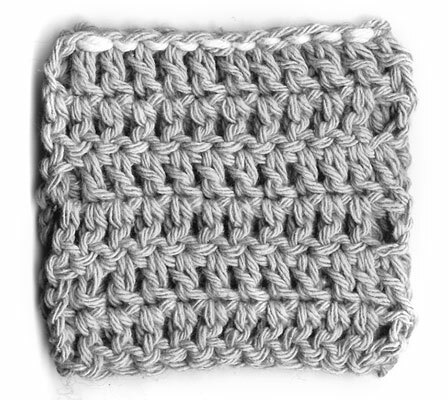 If you’re working along the top edges, simply stitch the seam under the top loops of a stitch. If you’re working along the side edges, insert your needle under the two threads found along the side of the stitch’s post. Pin the 2 pieces together with their right sides facing each other and their edges aligned. If you’re seaming the sides of the pieces, make sure the rows are lined up; if you’re seaming the top edges of the pieces, make sure their stitches are lined up. With an 18-inch length of yarn (or the long tail end) threaded onto your yarn needle, insert the needle from front to back under the top loops of the first stitch, pushing the needle through both layers. Part a of this figure illustrates this step, which starts at the upper-right corner and gets worked from right to left if you’re right-handed. Lefties do the reverse. Bring the needle back to the front about 1/4 inch farther along the seam, as shown in part b of the preceding image. You’re always working through both layers. Bring the needle back to the first spot and insert it from front to back. Repeat Steps 3 and 4 twice. You’ve now secured the yarn to the beginning of the seam, so you’re ready to start backstitching. Bring the needle back to the front 1/2 inch farther along the seam. This is about 1/4 inch farther than where you brought it to the front the last time, as you can see in part a of this figure— hence the “2 spaces forward” concept. This is the same spot where you brought the yarn to the front on the last stitch, hence the “1 space back” idea. Repeat Steps 6 and 7 as you work along the seam edge to the end designated by your pattern. To secure the yarn, work the last stitch 2 or 3 times in the same spots and then cut the yarn, leaving a 6-inch tail for weaving in later. This figure shows a finished backstitch seam.